David asked after my availability and sizes and such, stating that he didn't yet have the exact shooting dates, but that it should be three days in March (sometime after the 12th), and another day possibly in April. He mentioned on the message that he was out and just to leave the info on his office voice mail; I returned his page and left my sizes and my Always Available [for movie work] status on his voice mail. David paged back to confirm the actual scheduled shooting dates: Monday March 10th, Monday April 14th, Tuesday April 15th, and Thursday April 17th. He and I were mutually surprised as the one day went to March and the three days went into in April instead of the other way around. Either way, I always have time to work on a movie. David called to give me the confirmation number to call late Sunday afternoon for my Monday calltime. He inquired as to my being able to drive: the probability exists I might drive up in the milk truck! I assured him this should be no problem; back east years ago for a single summer I drove a Good Humor classic style ice-cream truck for a summer. I called in for the location, call time and such. It is 8:00am at Joe's Parking lot at 3rd Street and Main Street downtown. I was also told to bring brown shoes, a tough mission late Sunday before a day's call when I don't own brown shoes. When I confirmed, I indicated I was busing, not driving (and that I could bus right to the location as I wouldn't be parking a car), David shortly took the impressive trouble to page me back, indicating that the base camp was at the parking lot. This implies that either we're working locally or while that location is base camp, we may eventually be shuttled to some suburban type area nearby. We were in downtown Los Angeles, but the set was inside a warehouse as the inside of the Zoltan barn when we worked on Dude, Where's My Car?. By the sound of the confirmation/information line, the second unit (with which I'll be working) may have quite a number of background people as well. They're to bring solid colours, no patterns (the way cartoons generally are drawn). I have set up my schedule to arrive around 7:00am for my 8:00am call time as for any movie call, I'd rather be an hour early than a minute late. This afternoon I also learned that my friend Bill Blair would also be working on Garfield, as a veterinarian at Dr. Liz's office. I rose at 5:00am and after showering, shaving, dressing, I caught the #2 bus on Sunset to 3rd and Hill by 6:40am. I got myself a scrambled eggs and bacon breakfast and hung out while about thirty to forty background people showed up as 8:00am approached. We got shuttled to the set, all of a block away. The actual filming this morning was at Third and Spring. A sign for a train station was hung atop a cherry picker. As I was not needed for this sequence I only caught a glimpse of it. Annette with wardrobe had me hold off getting into my milkman outfit as I would not actually be needed until the crew moved to the secondary location after lunch. Around 10:00am Annette noticed my black shoes, and provided me with khaki socks and different black shoes, citing that the outfit was "to be very specific." While I hung out I spoke with Luther, a pleasant and amusing security guard, who regaled me with various previous movie and music video gigs for which he'd worked. We looked over the call sheet so I'd know to where we'd be going after lunch. Apparently a small area in Crenshaw at the corner of Valley Ridge and Mt. Vernon. However, to my surprise, the announcement/declaration at the garfield.com site notwithstanding, the call sheet clarified that this is to be a Universal Picture, not a 20th Century Fox film (I would eventually learn it was a co-studio film). 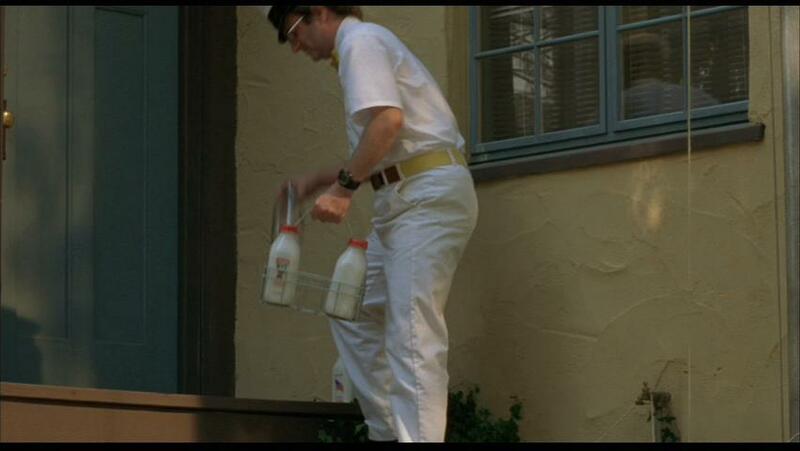 I put on my milkman outfit (having neglected to have with me a camera that day). The outfit consisted of predictable white shirt and slacks, black shoes that were provided, a yellow (clip-on) bow-tie, and a yellow spandex-like belt with leather ends. As we broke for lunch from noon to 12:30pm (roast beef), I was given a large shirt to act as a bib (just in case). We were shuttled not to the new set-up base camp but straight to the set at the Mt. Vernon and Valley Ridge Road intersection. There awaited my milktruck; a 1984 USPS truck painted beige with a blue stripe down its front, and Larabee Dairy logos affixed to the sides. I was told I'd be driving up to that same brick house (4181) in front of which it was parked. The small truck turned out to be an automatic, "but" was a right-side driver's seat, which was new to me, my five days in London in 1984 (mostly visiting Germany) notwithstanding. I had no trouble working the conveyance. I did a trial run through the interesection to a side street (Enoro Drive), where I found it had a great turning radius. Back past the house to the next ?ide street past the crest of the road, (Kenway Avenue), where I turned about again and parked in front of the house. Everyone was satisfied I could handle it. We did a few rehearsals; as my undershirt sleeves showed below the shirt, Annette affixed my undershirt sleeves with double-stick tape. I was to park in front of #4181, walk up with two bottles of milk, exchange them for two empties, and depart. They added on the front walk a newspaper, which (as being the friendly neighbourhood milkman), I'd politely pick up and deposit through the foyer gate at their front door. The two glass Broguiere's milk bottles were filled with milk and by 2:15pm we were ready for picture. I'd thought it was Basil over the radio giving me directions on Action (I would later learn it was Matt). Second Unit Director Mark Vargo walked up to the truck before we really got going and simply said to me, "You live to deliver milk." I was to enjoy what I was doing; pretty much what I'd figured. Arrive, deliver my milk, depart. One of my main on-set precepts is: "The story/film is the star, not I." 2:15pm - After Take 1 it was suggested I "slow down" my action a bit. After Take 3, over the radio I was told, "Very good with the paper." So I kept doing it that way. Take 4 seemed to be "the one," as they changed to a longer lens, the shot of which they got in a single take. 2:35pm - They set up a new camera shot with a green portable picket fence and brought-in bushes for a wider shot. This was going so efficiently I suspected we'd be wrapping rather quickly. 3:05pm - Over the radio I was given I heard them announce they'd be bringing in Nermal. Over lunch Annette had indicated that only Garfield would be CGI. The other well-known and beloved characters would be actual cats and dogs, their lips computer animated to speak, a la Cats & Dogs and such. One had to wonder, why stray so far from the source? Why have Garfield as Garfield and none of the other characters as themselves? On one hand, if all the animal characters were CGI, there would be a uniformity in the film's Garfield Universe (and CGI is easier to manipulate than live animals). 3:15pm - I waited as they put "Nermal" in place with the Garfield stand-in (a well made Garfield model, complete with fur and familiar smirk). Instead of the grey tabby that is the kitten Nerman of the strip, they are using a very pretty young Siamese cat. 3:20pm - Take 1 had a rocky start as over the radio I didn't realize that "Okay go, Larry!" meant me. He kept on calling "Larry" to go; after a few moments I figured he must mean me and I did my bit. He'd realized and after the take he apologized that he'd misspoke my name. I decided not to point out that while my full given name is Geoffrey Lawrence, no one has ever called me Larry (hence my not initially responding to it). Take 2 got screwed up from traffic or such. For what would look like a quiet neighbourhood, it had more traffic than I'd have expected. Take 3 got cut as I reached the door and takes 4 and 5 I'd made it back to the truck (but due to the Cut I did not have to drive away). After each take, particularly when I drove away, my scene had to be reset. (One of the P.A.s [?] named) Mike re-placed the newspaper and with the milk bottles ran to my #1 position (two or three houses down), exchanging them for the empties. At first I would drive, do my turn on Enoro Drive, come back, turn around via Kenway Avenue, and be back at my #1 in time to bring out the empties and meet Mike halfway. Soon he was speedy enough to be waiting for me at my #1 position. One nice aspect of the work was that each time I did get to the drive-away, one of the P.A. 's would catch my eye and she would smile at me. At 4:00pm they changed the lens for a tighter shot. About ten minutes later over the radio came an announcement about "blue pages of script" coming out, to which came the reply, "Fantastic!" I never knew if the response was genuine or sarcastic. They did a few takes of Nermal without my being in the shot. Around 4:30 they checked the gate, announced changing the parked background cars for The Next Scene; that while I was done, I wasn't yet being wrapped. I watched as they filmed what the earlier seen call sheet described as "Reverse of Garfield's courage," a term that seemed at the time to make no sense. What the grammatical nightmare meant was, a reverse shot in which Garfield summons the courage to head to the big city. The puppeteer (who I learned made the model) "carried" (nearly had to drag) the Garfield model down the street. They also did plate shots and matching shots, etc. Suddenly finding myself next to the same P.A. who'd been smiling at me, she thanked me for smiling at her. We'd both thought the same thing: that the other was initiating the smile. We introduced each other and I pointed out when she smiled, there was a slight Marla Sokoloff quality to it. It turned out Alexis doesn't watch The Practice nor had she seen Dude, Where's My Car? I gave Alexis my card so she could check my web site and see my Dude page. and she noticed my realbadger moniker. She indicated her friend online also very much into badgers, and I realized she was referring to Sean Biggerstaff (who played Oliver Wood in the first two Harry Potter films). Alexis is as growly as I about how the third film's painfully truncated screenplay adaptation of J. K. Rowling's third Harry Potter title may well drag that film series to ruin. When I told her I was a Hufflepuff, she chuckled that she'd done the online Sorting Quiz and was Sorted into Slytherin. "You're not a Libra, are you?" I asked automatically. As filming for the day was wrapped at 6:00pm: I spotted a scene breakdown list that indicated they'd actually filmed this past Friday as the first day. With a few others we were brought down by van to the current base camp. I changed back into my own clothes Kenny signed me out as of 6:12, citing that it was when I was "done with wardrobe" that I was officially to be signed out, not the time I'd be returned to the original base camp. I didn't argue the matter as I'll be working another three days on the film in thirty days. As being bussed back to the original base camp (where were many peoples' cars) had became "pointless" and as I was right at Crenshaw at Stocker anyway, I just hopped onto the bus north towards Hollywood and home for the night. As I passed her on the way to my bus, I did manage to say a quick goodnight to Alexis to Have Fun and [to] Remember Cedric Diggory...! While at my then-current flexible day-job, David Anthony paged me, indicating that the dates had been moved around slightly, but that another day had been added to my working on the film. Works for me! On the message he accurately deduced, as he put it, I'd "be good to go as [I'm] pretty reliable." I returned the call and got the new dates and clarified my being Always Available for working on a film (if not already booked on a film). The new dates on which I'd be working as the Milkman would be Tuesday April 15th, Monday March 21th, Monday April 28th, and Tuesday April 29th. He told me to give him a call Monday the 14th for my Tuesday calltime, for which I thanked him. As I'd written down the dates quickly as I was at my then day-job, I actually failed to notice the last date. I didn't point out to David this could be the first time I'd be working on a movie on the day traditionally celebrating my birth. I updated my outgoing pager message to reflect the new dates, in case anyone calling needed to know my acting work availability. I got a page from Rich to remind me I was working Garfield the next day, amusingly noting (by my message, which he complimented) that I already knew it. He indicated David would be calling me later with the calltime. When I spoke with David around 6:30pm or so, he gave me my calltime as 10:00am at Universal Studios at Soundstage 27. The last time I'd worked at Universal Studios, it was on the New York Street on the outdoor backlot for the award-winning second Volvo Stray Dog commericial. I had worked on an episode of (the apparently invisible) TV sitcom series 3 Sisters on a Universal soundstage, so this marks my first movie soundstage work at Universal. To verify I'd heard it right, I asked a friend of mine to listen to the message. She heard 7:30 as well, so that's that. I called and left a message on David Anthony's line acknowledging I'd received the message. Come the morning I would go in to arrive around 7:00am to ensure being On Time with about a half hour to spare (and get a good warm breakfast...). I got to my 7:30am call by 6:45am. The Red Line took me to Universal and I was given a backlot pass and directions to Stage 27 at the gate. As I walked I spotted Alexis waiting for a shuttle to take her to 27. As I had a backlot map, I pointed out that the destination was about 100 feet around the corner of the building in front of which she was standing. She and the other crewmember figured they'd wait so I walked over to Stage 27, from which there was a shuttle to take us up to to the set location. As I approached, Frank saw me and declared with amusement, "Well, if it isn't Geoffrey Lawrence 'otherwise known as Badger'..." As the day progressed, there were other polite jibes, obliquely implying this web page had been visited by various crew members. We were driven up to the back of what was called Elm Street, though it doesn't show up on the backlot map. Around the corner from the Best Little Whorehouse Chicken Ranch and between that the Jaws tram attaction, we were brought up from the back. We walked through the back of a facade house, which I was later told would be the Arbuckle home. We were led to the catering where I rather hastily had breakfast before shuttled back down to the base camp (near the New York city street), and Annette gave me my milkman outfit. Taking a moment to start filling out my voucher, I sat on the fabric step and found it to be quite still moist from the previous day's rain. I changed, Annette was kind enough to take a photo of me in the outfit, and I was shuttled back up to the set. I waited as the milk truck was being refinished with its "dressing" (the outer labels). It turned out that both Units were working the same street. 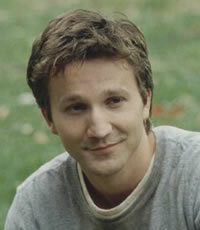 First Unit (with Breckin Meyer) took up the end of the street at the Arbuckle house. Second Unit (with the special effects) took up the mouth of the street down to the corner. This began to cause a slight conflict: each time I was to drive, First Unit would roll camera, and vice versa. Eventually we were able to get a couple of "practice drive" runs, which (I believe) were also filmed. As the road was ended in a cul-de-sac (and First Unit there), I'd stop at the corner and at Cut, Teamster Craig Scott hopped in and drove the truck in reverse to my #1 position. First Unit finally finished around 10:30am, so they announced they were now headed over to Colonial Street and so we had to unblock the mouth of the street for them to take all their stuff. At one point the area at the mouth of the street was so cluttered with equipment than one of the tram tour guides indicated to her group that it's rare to see so many films being done all on the same day. Only a few times did I hear the passing tram guides announce to their group that this was the Garfield production. I had some clarification, as I heard a tram tour guide declare (and the crew clarified that) this is a Twentieth Century Fox film, merely utilizing Universal equipment and resources. Maybe the Twentieth Century Fox backlot was all booked up. Craig indicated that he's gaffing this film, so he politely requested I take a photo of him with the truck, which I happily obliged. Later he took a shot or two of me with the truck. Little did I realize what was to come due to this "humble" beginning. Having heard a crew member point out what a clear "day it was for photos" (not to be confused with "filming"), I made the prime error of mistakenly believing I could take a few more photos on my own for my scrapbook and personal non-professional use. I took a few shots even of the tour tram as they went by. With First Unit gone, I was close enough to see the empty "director's chair" for Jennifer Love Hewitt, so I took a simple shot of the empty seat with the name. I watched as the trainers rehearsing the pretty cat portraying Nermal (rehearsing a behaviour that was not being filmed today). I met the pleasant Tyler, the dog who was playing Odie, and (my loving animals anyway), I immediately fell in love with the adorable little terrier/dachundt mix, so now I have no problem accepting him as Odie, although I did note his eyes are extremely intelligent. The animal trainer was kind enough to take a couple of photos of me with the beautiful dog, having him stand up his front legs up on my sqatted knee. I'd planned to give the wrangler copies of the two shots when the film was developed. I met (but did not photograph) the large and handsome doberman also being used (playing Luca), and learned he is "a leaner," as the pooch insisted on leaning up against my hip and leg. Despite my inclinations of letting him do that, I was wearing an all white outfit (probably one reason the black-haired dog wanted to lean on me). "My 'newsletter'...?" I responded, genuinely puzzled (I don't have nor do I produce a newsletter. Those cost money and postage...). 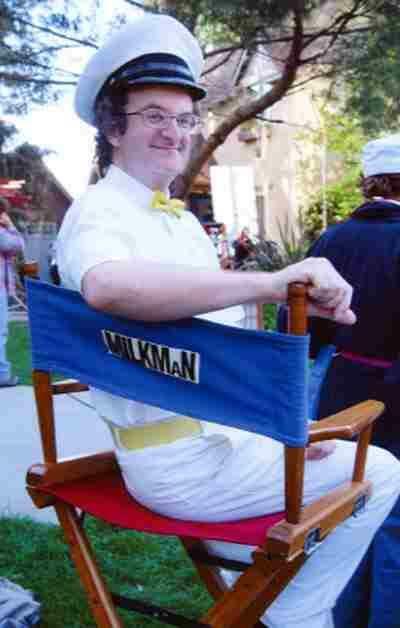 I also met Tim James (I think of the art department), who began replacing my milk bottle between takes. Looking far younger than he must be, he told me about working with John Wayne on The Shootist, and how the Duke walked the way he did as he had a short toe on one of his feet. Throughout the day the crew was still very nice and pleasant, and now after a month, was now even more efficient. We finally broke for lunch at 2pm and we shuttled down to base camp for lunch. To my surprise, two different background artists (being used for the afternoon, as I was done for the day), came up and remarked having found the original page with most of this content (since moved to here). Each of them also misinterpreted my Good Humor truck reference, overlooking my indicating having drove one for a single summer in my youth, to meaning it was what I was doing for this film. 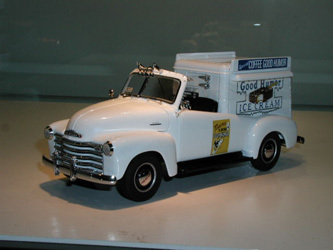 I updated that reference to clarify (and I reiterated again for the report), that back in the late 1970s and after I graduated high school, For One Single Summer, I drove a classic style Good Humor ice cream truck, which was slightly similar to the (former postal truck, that has been done up as a) milk truck for this movie. One of the two was a pleasant gentleman named Bill Platt, who came across my then-Garfield-page (he believed) via Yahoo! 's search engine. I'll have to check that. He indicated adding on his site a link to [that] page (although he didn't give me the URL to his page, so I could not return the favour). Before going down to lunch, Basil went over with me the upcoming schedule. I told him what I'd been told: next Monday, then the following Monday and Tuesday. Basil figured that I will be needed now possibly on Tuesday April 22th, but more probably this will be shifted to Wednesday April 23rd. Due to these schedule shifts, the originally set dates of Monday April 28th and Tuesday April 29th, all were virtually "too far away" to be confirmed in stone. And later after lunch there were hints of a day or two maybe needing me even beyond those. This amusing shift of scheduling dates reminded me of work back on Inherit the Wind, during which an AD was asked how the three-week shooting was progressing. She had replied that at that time we were three days behind schedule, which surprisingly was good, as initial projections had had us by that date to be a week behind, so being "only" three days behind was great. Kenny signed me out at 3:18pm, giving me sufficient time to get to my rental box and retrieve last week's compensation for my private labour. David Anthony paged me to notify me that this week's Garfield work date is in fact pushed to Thursday, April 24. He indicated he would call me on Wednesday (afternoon or evening), to let me know the call time (and, of course, if the date itself is pushed yet again to Friday or to early the following week). In the early evening David Anthony paged me with my 7:00am calltime the next morning. David notified me again later that evening that the calltime had been pushed to 7:30am. I arrived at Universal at 6:50am for my 7:30am calltime, and found the catering truck with which to have breakfast. I was shuttled up to the set, the back of the Elm street cul-de-sac house facade. Frank gave me my voucher that I filled out while Annette got me my outfit. I gave her my voucher and took my outfit precisely at 7:30am. Frank gave me a copy of the day's sides so I'd "know what was going on." I was introduced to young and pleasant Chris Verdiglione, who at the time was considering (and eventually did take) the stage name Chris Lione. He was working as a Breckin Meyer photo double, booked as such having him a SAG Must Join. A fellow Taurus (April 27th I think he said), we were each given a trailer room not only in which to change, but in which we could rest before we were needed. We opened the partition and chatted while we waited to be called to set. Chris had worked recently on the feature film The Girl Next Door in which he became SAG eligible when he got a line for the film. 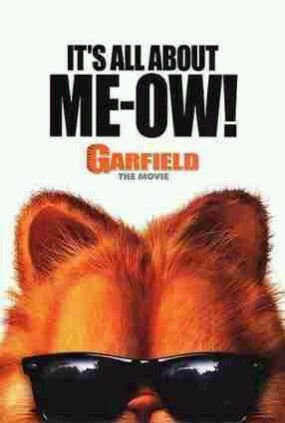 He joined SAG the moment he got booked on this Garfield gig. Half-hour lunch was called at 12:30. I got back to set just after 1:00pm. I was told the actual craft services table was "on set." Once on Elm Street, Matt asked me if I was aware lunch had been called. I told him I'd just come from there but was informed the craft services table was somewhere on set. Matt pointed me to the house in which it was situated, the Arbuckle house. I'd thought the Arbuckle house was the house at the end of the cul-de-sac; this one was two houses over, on the same side and two houses from the corner at which I deliver the milk. Chris and I continued to wait, noting that as our calltime was 7:30am, that with the half hour lunch overtime would start at 4:00pm. Frank at one point told me that possibly my bit might be pushed to tomorrow/Friday. I assured him of my Always Availability (for movie work), realizing afterwards that such would mean my having to call to notify either my temp agency (as Monday the 28th and Tuesday the 29th were still booked and on schedule) or my day-job supervisor directly. No problem, really. They were all aware upfront about this project even before I began the assignment. While drowsing at one point up in my trailer, there was a knock at the door. I opened it to see Annette smiling up at me, her arms wide. She looked like she was silently asking for a hug. I thought (my noting at that moment it was 4:00pm), that she was there to tell me I was being wrapped for the day, and that indeed I would be back tomorrow. It turned out that at very the stroke of overtime, I was being brought to set! I was amazed and flattered. I was informed that Art Department's Eric Luling (also the Set Dresser) had done it up for me and I later thanked him for the honour. More than once I'd see Eric sweeping away leaves and debris from the curbs, or as I jokingly put it, "Making the streets cartoon-clean." As animals were being used, around the set one woman animal handler had with her a beautiful little Jack Russell Terrier named Dash, who is being groomed eventually to replace Moose on Frasier. As I sat in "my personal chair," I found it had been situated directly behind Second Unit director Mark Vargo's chair, at which the video playbacks could be viewed. Off to the side, the person running the board was going through some footage and I "inadvertantly" got to see my street-crossing take/milk delivery from the other day. Meanwhile, everyone was getting into place the camera arm, the lighting and all. It's amazing and near magick to watch this film crew at work. While some of the crew were mock-growling at the anticipation of having Friday night as being a night shoot, others were enjoying their time together and relating comical mis-takes that'd taken place during the production. I spoke with Garfield-model maker and puppeteer Val Sykes. "All for one and one for.... oh wait, that's musketeers..." I quipped, jokingly trailing off. "That's pretty funny," Val chuckled. He wore his S.P.E.C.T.R.E. Robotics t-shirt, but indicated it has "been some time" since he worked on the site. More than he realizes, considering it comes up as no longer existing or having been moved (though via a google search, the search term spectre robotics still comes up as though valid). According to his IMDB entry, Valek Sykes' Official Site is Tech-Works FX studios, which listed Garfield amongst their credits. 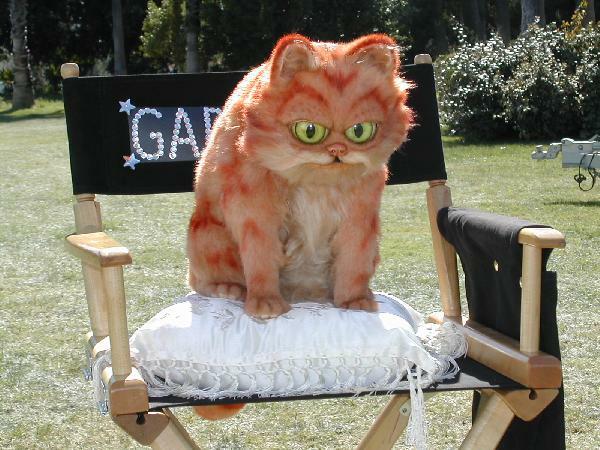 On their gallery page they had a photo of the on-set Garfield model. I pointed out one of Garfield's eyes looked a little bugged out, reminding me of my Animal Control days were I'd have to pick up animals that'd been hit by cars. Val told me how they bought from him that initial Garfield model to be used for a stunt. They had Val eviscerate the model so they could weight it down. They dropped it from a(n apparently substantial) height so it would crash through and into a Lasagna truck. For the effect, Lasagna was splattered everywhere and the now-cleaned model was "still a bit damp." Val had to reopen the belly again to remove the weight. Chris came out to the set for a time, but based on results, he was never used. It was deduced that most likely he would return Friday. They needed the cat playing Nermal to hop into a bucket. (Via a Rube Goldberg like device, Garfield had it all planned out that such would get Nermal out of the way while knocking over the milk bottle so its contents would easily just pour into Garfield's mouth.) Then they brought me in to deliver the milk. I was told that the bottle was not to be moved (I thought they meant it was Placed due to light, focus, etc., so I assured him I would not touch the full bottle). I quickly learned, as did Matt, that the full milk bottle was actually attached to the specific porch plank. Matt made to pick up the bottle for me, unwittingly pulling at the top as his fingers slipped off, rocking the (attached but loose) bottle enough to splatter out of it just enough milk for it to have to be cleaned up (not enough for the bottle to need to be refilled). We went over my business; it'd be the same as the other day. They concurred it'd be best I put the empty down next to the full bottle, and would simply pick up the empty as though I'd just put down the full bottle. It ended up being time that Nermal would all but go between my legs as I passed (as though) to return to my truck. The cat doesn't go between my legs. I pick up the empty and turn toward the road, puttinginto my hand rack the empty bottle, and then just walk under the film crane. The camera by then has tilted down to show Nermal scooting behind me to the bucket. I think they only did about three or four takes with me. Noting that in my short sleeves I was feeling the growing chill in the very late afternoon air, director Mark gave me his jacket to wear as I sat behind him. They did some takes focusing on the potted geranium plant on the second floor window. As though suddenly realizing how far along they were, Mark turned to Matt and simply said, "Wrap Geoff." Matt notified Annette via the radio; the two men thanked me and reiterated I'd be back for Monday and for Tuesday. We wished each other good weekends and I was off to wardrobe. I noticed Annette fussing with the flowers on the Arbuckle porch. I asked if she'd heard the announcement I was wrapped; she said she had and would be there by the time I was ready. Back at the trailer I noted Chris was gone, hence my figuring if they needed that shot with him, they'd probably do it the next day. Frank was waiting as I emerged, gave Annette my outfit and retreived my voucher. (As over the radio came the general wrap for everyone), Frank signed me out at 6:42pm. I was shuttled back to the front entrance from which I cross the street to the Red Line to home for the weekend. David paged me to let me know that as they were night-shooting that night, they wouldn't know until really late as to what time Monday they'd need me, so he'd relay the information to me the next day/Saturday sometime probably around noon or so. David paged me with my 6:30am Monday morning calltime at Universal Stage 19. Up at 5:00am, taking the Red Line and arriving at the Universal gate at 6:00am, I found my name was not on security's sign-in list. The woman called in, indicating my positive ID; I even showed her the passes from previous days. She called in for me to give my name, and it went into the system. She handed me back my ID, and I asked for the return of previous studio day-passes. "Oh I'll hang onto those," she said carelessly. "I uh, don't think so," I said, politely, scooping up my property. There was nothing of use to the expired gate passes other than my retaining them in a scrapbook (as I indicated to her as I retreived them). Her only use for them would be to discard them. I arrived at Stage 19 around 6:15 and got breakfast. Shuttled up to Elm Street by 6:25pm, we learned the nearby Court of Miracles was being used for the day for a commercial or music video. Annette and Frank informed me I'd be used "right away," so I got my outfit on and quickly headed onto the Elm Street set. They had Val Garfield model under Jon's car for a shot. After a bit I was set up to deliver milk to the corner house still. Chris was back and they had him drive a Grand Am in the opposite direction for a car-cross as I'd pull up to the corner to park. Mark and I found where the truck was parked was fine, and a natural crack in the sidewalk served as my mark. Unfortunately I blew the first take when there turned out to be more than one similar crack, so I'd stopped one sidewalk crack too early. From then on I always hit my park-mark. Take Two worked, but they wanted to go again, Matt announcing over the radio, "Chris, this time don't drive like your grandmother..." Chris later told me he didn't realize they wanted him to drive "normally" (e.g., faster). As I awaited for Take Three Action, Matt (over the radio) indicated to someone the take had been good, "except for the grandmotherly driving..."
The camera was set from the driveway to show my arrival (bringing the milk to the porch), and my return to the truck. During one take, as I came off the porch, a power cord or such snagged around my left foot. I believe I was still off camera, so I lifted my left foot quickly to let the cord drop then proceeded back to the truck across the street. The following take had them check both gates (as they were using two cameras for the shot). As there was "a big turnaround" (setting up the cameras for another shot, angle, etc. ), Chris and I went back to our trailer to relax and await being needed. Jennifer Love Hewitt photo-double Carolyn Christian was also back for the day. She and Chris each knew they'd be back the next day on the 29th. At lunch (as Chris choose to remain behind and sleep in the trailer), I ate with Carolyn and we discussed her artist husband Mark's filming (a documentary, a Charlie's Angels type spoof, and some possibly upcoming stuff). As the music video was inconsiderably blocking the Court of Miracles, we had to be dropped off at the front of Elm Street. On the set, Aaron wished me next-day birthday greetings, jokingly alluding to have seen the reference on my original Garfield page ("Where else would I have read it's your birthday...?"). "How old will you be?" he asked. "Hopefully older than I look," I replied diplomatically. "Good answer," Aaron chuckled, flashing his George Clooney-like smile. Chris, Carolyn and I were wrapped at 6:30pm, Chris and I to return tomorrow. Missing by scant seconds the Red Line I wanted to catch, I arrived at the Universal Gate just after 6am. I arrived at Stage 19 at 6:15am to find it closed and the area deserted. Not a clue as to why or where was anyone. To conserve power, my pager auto-shuts off at midnight and auto-switches back on at 6am. Last night I may have switched it off at 10pm when I'd turned in, so any surprising change page I may missed. I scooted down to where were our shuttles, and I was brought to nearby soundstage 28, where we'd been moved as They were going to tear up the flooring on 19. Stage 28 had this impressive operatic-type facade going, but clearly it'd been there for quite some time. I later learned that (d'uhr! ), it was the famous Lon Chaney Sr. Phantom of the Opera Masqued Ball set and (reputedly haunted) soundstage! Sweet! I saw Matt and told him of my brief concern when I'd arrived to find Stage 19 "deserted." "You're not the only one," he assured me. Once up at the set, I got my voucher and outfit. Annette smilingly reported that the call sheet "implied" I'd be used early, but we figured I could wait before I put on my white shirt and such. I mentioned to Frank that the recent Mares' Tails clouds notwithstanding, it was a surprisingly clear day. He told me that as it was, it'd been pouring rain that morning just over in Thousand Oaks. Val got recruited ("drafted") to be in a scene with First Unit (still shooting). He later reported he opens a door to a stairwell through and out of which Garfield blasts. Due to the many angles they used for the momentary sequence Val would (might?) be visible on screen, Val postulated, "How many times can they film an opening door?" "For as long as such a (sight) gag keeps being funny," I pointed out. I also reminded him, "As you're the one opening the door, the whole bit 'hinges' on you...!" Lunch was an hour (12:30pm to 1:30pm), and as we were being shuttled back down to Stage 28, we spotted Shannon Elizabeth (pre-filmed segments of MTV awards were being shot on the lot that day). After Chris and I were certain there was only "exotic" foods "available" for lunch, we checked out the nearby backlot Universal Store, then I headed back, realizing they at least might have vanilla ice cream again. Chris went "Shannon Elizabeth hunting," but ended up coming all but face to face with Justin Timberlake and Seann William Scott. D'oh! I would have liked to have seen Seann again, having worked with him on Dude, Where's My Car? Aaron later indicated to me that he'd seen Shannon and Seann earlier in the day. On the van being shuttled back to the set, we passed an oncoming Steven Spielberg, driving his own golf cart. Chris got wrapped at 2pm for the day, to return tomorrow to do the shower scene. Talk about "wet work"! Tim gave me two separate hand-drawn birthday cards he'd done, doing very recognizable charactures of me as the Milkman (surprisingly well done, as generally I tend to find charactures creepy). Eric took some digital photos of me and the cake, plus a shot of me with Frank, Annette and Tim. He made sure to frame it best as he indicated he had (the photos being included on) this page in mind (though I never received copies of the taken photos). Filming work was still going on, so quietly people (who were able to), wandered over to get a slice of birthday cake, and throughout the day various members of the pleasant crew had been wishing me a happy birthday. I was wrapped at 6pm. On the way home, Hollywood Boulevard was a blocked off madhouse for the big-premier of X2: X-Men United at the Chinese Theatre. I managed to stop by the box office to get my ticket for the feature's Wednesday night/Thursday morning midnight-showing. I awoke throughout the night from strange, vivid and continous dreams with bizzare disturbing imagery, eventually waking close enough to the alarm going off that I just got up. I arrived at the Universal Gate at 5:55am for my 6:30am call, and at Stage 28 had my breakfast. I got to the location and trailer by 6:25am. Annette told me that they were "uncertain" as to when they'd be using me, so we concurred I could "just hang out." She and I both knew I can get into my outfit relatively quickly, once I was needed. Chris arrived and slept like a log nearly the entire morning, impressing me that he can outsleep me...! I relaxed, for the umpteeth time re-reading Harry Potter and the Sorcerer's Stone. Aaron came back to wrap me for the day as of noon. They'd realized there was no way they were going to be able to get to my stuff today. That happens. They were getting ready to have Chris do his body double work (showering in Speedos), and Aaron didn't know if I'd be needed back tomorrow, on Friday, or what. Obviously, I'll be called if needed. I assured them I was Available should the need arise, and I left for the day. I planned to stop home, suit up and scoot to my day-job, but shortly after returning home I learned that my then day-job assignment had been terminated anyway. Boop! As scheduling prevented getting together with a friend of mine, she and I arranged not only to see a UCLA stage production of Hair at the end of May at UCLA, but we also planned on going bowling Friday night at an alley to which I'd once been, near my friends' Glendale home. Apprarently while "trapped at a baseball game," David Anthony got the call to get me to the set the next day. To make sure I got the message, he had coworker Carol Grant page me. She actually called my voice mail twice just before I realized my pager in the next room was going off (d'oh! ), the second message giving me David's cell number on which to confirm I got the message(s). I called and got David's voice mail, confirming my 6:30am calltime the following day, and my wishes that whichever team for which he is routing, wins. At the Universal gate at 5:55am, I was at breakfast at Stage 28 by 6am. Being shuttled up to the back of Elm Street, driver Kevin Pullin (one of the several pleasant drivers working this shoot), indicated he was having some trouble being able to find The Report Page I'd been keeping up to date. I gave him my card, on the back of which I wrote the URL for the [then-current/original] Garfield report page URL. Now the majority of the content is here: the report is far more streamlined, if one can believe it. Mark arrived in the van after me, then Frank and Basil arrived, both indicating I would be first up. Annette, however, indicated that the cleaners had not done as good a job as they could have, and the white pants had still not been brought up. Frank had given me my voucher and I changed into what was available of the outfit. Aaron called back (while I still wore my black jeans) to let them know I could do any walk-throughs, but they figured it could wait for the pants so I was to hang tight. Annette and I waited, discussing movies and such. When she indicating having worked Star Trek, I asked her if she knew Bill Blair. She knew him and remembered his also working a day as a veterinarian there on Garfield. The shot entailed a dolly shot in a tight close up on the bottles as I leave the porch, which continues on with Garfield peaking out from a bush, crossing to behind me, with Odie [li'l dog Tyler] following close behind. In every shot but this one, the bottle rack is in my left hand. For this one close up of the bottles, they had the bottle rack in my right hand so as to be "facing" the camera. Had I realized this the other day, I could have left the porch always with them in my right hand. After a couple of rehearsals, we started rolling. I started slow so as not to seem to rush out of frame. Mark had me increase my speed "by five percent." They did a reference shot first; once I left frame, they had Val walk through with the Garfield model, with Tyler following it, then subsequent shots had me leave frame and show Tyler walking the same path on his own (the clip of which would be shown at least twice in the feature documentary Strictly Background). Once they had the subsequent action taking place after I'd left the frame, Dave would scoot in with a square blue screen (approximately four foot by four foot), placing it at three integral points for the computer animation folks with which to work later. Eric had with him a print-out of this web page, as current as the April 30th entry, clearly printed sometime last night, even to the mention of a friend and I going bowling Friday night. Eric joked he'd see me "at the premier" (which would be great should I be invited. I'd love to work with any of these great people again. It was 8:00am; Frank signed me out at 8:30am though (as he even realized), either way I would still be receiving the same amount of earnings for compensation for my labour. A surprising bump was added as I'd "been so great," Frank indicated. "Everyone's enjoying your [web page]," etc. To the Universal Front Gate I was shuttled, off to the Red Line and home. After visiting my friends Scott and Laura in hospital to meet Eric, their latest family addition born in the early hours of that day, a friend and I headed to Pickwick Lanes in Burbank as we'd planned. We arrived around 8:30pm to see a sign out front: Garfield Wrap Party. As I had worked on the film, we were admitted and I was able to say hi again to Matt, Aaron, Annette, Tim James, Chris (who'd learned about the wrap party on set and that he had wangled an invitation), and I spotted easily-recognizable character actor Stephen Tobolowsky, who plays Happy Champman in the film. Until we eventually departed around 11 or 11:30pm, my friend and I had a blast, bowling three games with Chris, Eric and Val (and earlier with Tim before he left). Sharing the lane was friendly Bryce Shields (the on set video assistant), and Kevin Ta, who worked on some of the precursor animation composition right on set, utilizing just-shot footage, working with the awesome Maya animation software. As usual, after months of my Not Having Bowled, my first two games sucked, but always improved steadily, and with the third game I was playing nearly as though I hadn't stopped. With a friend, we finally saw the Hulk movie, which was far um, "talkier" than one would have expected. (I wager such Marvel Comics based films such as Spider-Man and the two X-Men features have spoiled "us" [e.g., audiences] for those type of [otherwise] tight action movies.) At any rate, what I found fascinating about it was that two of the houses used in the Hulk movie were both Universal backlot "Elm Street" Garfield houses! The blue house with the white picket fence up in front of which Jennifer Connelly drives is the same house in which the model Garfield and Nermal cat sat, and across from which I parked my truck (eventually I would spot this blue house used in The Man Who Wasn't There, with Billy Bob Thornton coming to the door). Earlier in the Hulk film, Bruce Banner's brown house (to which he arrives on his bike, and later as the Hulk trashes the front), is the same house in the driveway of which had my birthday cake! 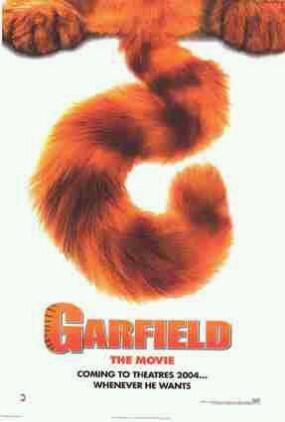 A while ago I learned that the Garfield DVD release date was October 19, 2004. Strangely, I completely neglected to add the entry of the date I saw the film theatrically. I had received an email from a teacher who had found the original report content, indicating her class were major fans of Garfield. We remained in touch: she kept up to date with my entries and would read them to her enraptured class. They went to see the film in the thearte as a field trip. She reported when I came on screen her entire group cheered...! A week or two earlier I attended a focus group, during which I noted one of the participants looking Very Familiar. After a few moments I deduced that he was an actor, though I couldn't place his name or from where I knew him, so I figured I'd seen him on a commercial here and there. At the end as we awaited our paychecks, I simply asked him if he was an actor as he looked familiar. He affirmed and indicated the same: that he'd felt he's seen me before as well. Evan Arnold introduced himself, as I did myself to him, and I ran a few titles by him, but nothing was clicking. He took my contact info and as we were each on our way out the door to do battle with the recent deluge of rains and floods, we concurred I could check his IMDB entry. Once home I checked and realized Just How I Knew Him, and most likely how he recognized me. The reason I bring this up now (date of this entry), is that this date when I walked into an audition, there was Evan. As we greeted each other and shook hands I simply told him. "I know now why we recognized each other: we're both in Garfield," which he found amusing. He'd brought flyers promoting his definitionactor.com website, though the flyer actually was a barbed satire [seemingly] about the current SAG crisis, where SAG has sold out its members about as badly as it can at the moment. The few days earlier I registered with a reputable Calling Service, Atmosphere Talent (its co-owners parted their ways and Booked Talent sprang into being, their roster into which I was retained). One of my duties is to call in each Friday with my availability for the following Monday through Monday, any time after 3:00pm (now it's between 5pm Friday and 5pm Sunday). As it implies, it allows for a small date overlap, which is a very smart, practical and efficient thing. This particular date, my pager-alarm went off at 2:59pm so I would know to make my first weekly Friday call-in regarding my availability. But moments before I even dial, I get paged. Turned out it was Kelly from Atmosphere Talent, with a booking! 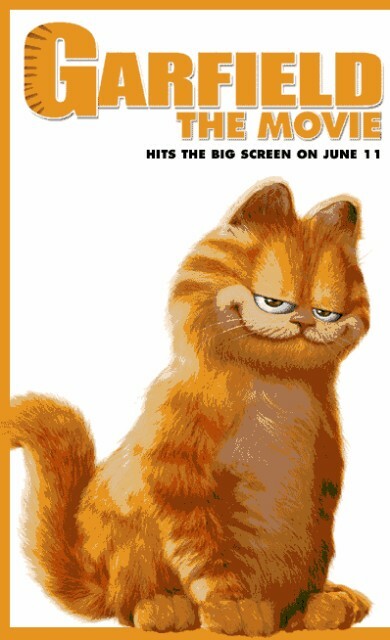 A nice surprise, but even more so, it was for Garfield 2! Up to now all the hotline listings I've seen for background work for it had been upper crust British butlers, British stablehands (the latter for which I blind-submitted on my own). 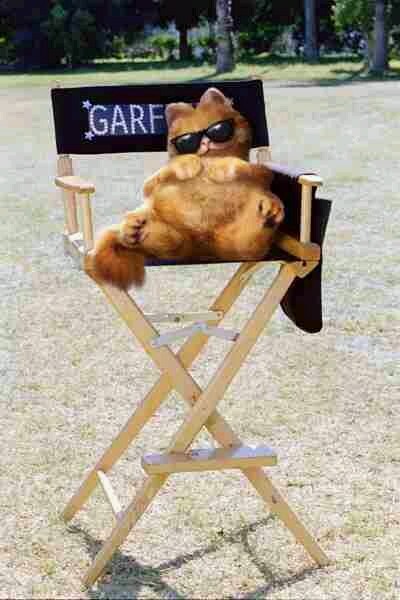 I called and left my avialability and declared my availability for Garfield 2. After a few moments I realized I was leaving the wrong information; and (having already called in my availability on the correct line), called the correct office line to confirm properly. I was told my shooting work would/could run from mid-September through November first...! Wow. I am stunned. Okay, let's see how general I can make this. I went to my wardrobe fitting, and several different outfits were considered. Wardrobe people Iris and Earl were each and both very pleasant with whom to chat, as was Francine. At one point I heard that Rusty had more responsibility in this feature. I went to sign out, and I was brought in to meet the Second Unit. I was told I'd probably be used both First and Second Units. I was introduced to Rusty who indeed was the same Rusty who booked me on Garfield. Rusty remembered happily that He Had Booked Me for that, declaring proudly that when he'd came across my photo that he knew I was The Man! Suddenly from behind me an icy, venom-filled voice stated, "You worked on the first Garfield movie..." It was not a voice of happy recognition, though Rusty was thrilled I was back. So here's where it gets tricky. Anyone who knows my sites (previous and current), is aware of my pride in being In Service to such projects. It is known I liberally promote the films in which I work, with the clear and obvious intent that People Should Buy Tickets To See such projects. It is said that a single complaint (or compliment) letter equals about a thousand that didn't take the action to complain. Now I cannot take credit for the entire Garfield budget to earnings ratio, but I do know that my original Garfield report page had numerous people (who didn't know of the film), letting me know How Much They Love Garfield and how much they now looked forward to seeing the film, many of whom had no idea the feature was being made. The behind-me voice is someone who had Issues with me on the first film regarding Behind The Scenes. I had been told this is "policy" and that this person is Just The Messenger. "The Messenger" also hated the fact that on the initial page I had a photo of the Val Sykes-built model of Garfield, despite it was a heavily promoted photo, even on Sykes' own site, from which I'd found it. Despite my assuring and re-assuring I would bring no camera to set and despite my assuring and re-assuring I never put story spoilers on my page (s) that is not already public knowledge (or what one would be able to read on the back of the DVD cover), I was told I was not to promote or recommend the movie Garfield 2 on the original web page location. Based on results, perhaps Garfield 2 was being made as a tax-write off, and this person wants/wanted it to fail at the box office. Free speech notwithstanding, I chose not be as detailed as I was with the first film. Under clear coercion and obviously under threat (that I would not work the shoot), I involuntarily "agreed" I would do my upmost not to generate any word of mouth publicity as it would be considered independent publicity from their own publicity. This is why I prefer being in front of the camera. These kinds of decisions are for the higher-ups and I will not speculate on their logic. Now were I to produce any sort of film, I would foolishly encourage everyone involved (cast and crew) to promote the feature as much as they could. I believe their logic as it was described to me probably does work though: I have come across numerous people in the past couple of years that have no knowledge that the first Garfield film was even made, let alone released in theatres and/or on DVD. So, I decided I would be as general as I can. I was not told I couldn't report I am indeed playing a stablehand. I was not told I couldn't reveal the seven dates that I worked (maybe even indicate if it was good or bad weather, as we had a couple of very rainy days that had me wrapped early), and that it could not have been foretold I'd literally only work ten minutes of the seven days I was on set and available, well into overtime the seventh day, and even then just crossing past an archway two and a half times, in a shot even I could deduce would not be visible in the finished film. In keeping with "the messenger's" new no-promoting-the-film-in-case-it-might-have-audiences-actually-go-to-see-the-film policy, I decided I would not reveal anything that is Not Public Knowledge (and even then I would use off-page links), including but not limited to: the [July 28 2006] theatrical release date, anything to do with Rhythm and Hue's Bill Westenhofer (who eventually I would meet on a John Cleese commercial), or Val Sykes other than if I see such elsewhere online. In keeping with what I've been told, I didn't even reveal the DVD's release date until after the DVD was released. Based on results, "the messenger" got the wish that Garfield 2 tanked review-wise, and "the messenger" must be thrilled that so many people aren't aware of either of the two having been made. I called the hotline information for my calltime and it was indicated that as "Something Bad Happened On Friday," many of those working the next day/Monday could have upwards of a four day call. Maybe. Calltimes were for a specific group and a few specific individuals, but I wasn't mentioned. I was concerned that whatever was this Something Bad, that it may be delayed my work dates. Carol and I spoke and she indicated What Had Happened, which I had intended not to mention unless/until it becomes public knowledge, but I neglected to even hide the information and now cannot recall what it was anyway. My calltime is 7:3am, but due to the location, breakfast is being served at crew parking; if I wanted breakfast I should get there earlier. With a 7:30am call I wouldn't be there any later than 7am anyway. A single public transport will take me Directly To Crew Parking. After I check in and have breakfast, I'll be shuttled to the Beverly Hills location. Normally I do a day by day, blow by blow account of my work on major productions. Due to the "Official Policy" laid out by She Who Hates Me, such "details" might be construed as helping to promote the film or worse, recommending the film, which could lead to her dreaded nightmare horror of horrors (which based on results, She Who Hates Me clearly must hate even more than hating me): ticket sales. On the other hand, as pretty much during five days The Same Thing Happened, I can compress the report a bit anyway. My calltime was the same each day, and I was never placed in front of the camera during these five days. I befriended pleasant actor and voice-over artist Ariel, and generally spoke about his own feature project See How They Run which he wrote and directed, and in which he starred. At home I watched its trailer on the site and was quite impressed. The feature itself at the time was still in the editing process. Friday afternoon my calling service paged me to let me know they booked me for a TV series shoot for Monday in Pasadena. I found this amusing as I was already aware that Garfield 2 would be shooting Monday in Pasadena as well. When I was wrapped I was told I'd be back for Tuesday. As I got to wardrobe I came across Billy Connolly again, who I had met earlier in the week as well after we'd been wrapped that day. He was working First Unit while "my scene" is Second Unit. Billy Connelly is so pleasant he almost makes John Cleese seem surly. With his brogue that just wraps one up like a comfy blanket, Billy related working this project has been fun, and he'd had a blast working on A Series of Unfortunate Events. While working on the TV series Sons and Daughters in Pasadena, the Garfield 2 basecamp was so close to ours that for breakfast, our project's director Fred Goss mistakenly first went to the G2 catering truck! The somewhat unexpected thunderstorm from the previous night predictably wetted down everything. Second Unit decided, and understandably so, to do some work within the mansion. I got to see inside the normally closed-to-the-public building, though obviously not a whole lot. Realizing that at the very earlier if they needed me at all, it'd be after lunch, I did my paperwork and asked Rusty if I could use one of the unused dressing rooms in which to use as (a dry) Holding. In this way I could also be out from underfoot. Rusty concurred with it as a good idea and agreed. I told him I would not put on my outfit until after lunch if at all, as we both pretty much expected I wouldn't be used today. Earlier when we'd arrived, 2nd AD Hans Berggren and I noted our set was moist enough to clearly be Different than when it was dry. I'd set my pager alarm for 12:30pm as generally lunch was usually 1pm. Walking up I came across Mark who announced I was wrapped for the day, which didn't surprise me at all. I would be recalled either for Friday or Monday. We fetched my wardrobe from my dressing room and I put it back in the wardrobe's truck, and Mark signed me out as we were shuttled up to First Unit basecamp where I could have lunch before heading back to crew parking. I called my calling service to notify them that I'd been wrapped due to the rain, and that I would be recalled either Friday or Monday, so they could keep aside those dates for me. I was told they might have something for me from Central for the next day, but with no callback on it, I guess that one didn't come through. So impressed with their performance so far though, along with a Thank You card to them, I enclosed payment for November and December (when I registered I'd pre-paid through October). Moments before I got to my bus stop to head home, the sun broke through, and stayed out for the rest of the day. I found this amusing, though I knew there'd be no way filming could have been done outside. (Not too far from the Garfield 2 crew parking), I worked on an episode of the NBC series Medium, although in the finished episode the framing didn't include me. I came across DGA Trainee Merry Chen and as she and I had previously discussed, I gave her the promised burned-DVD of a few of my best student film work (learning too late that her given name is Merry, not Mary [d'oh]...). As the morning progressed it appeared they would be filming me. Eventually. The cameras were now faced towards the archway/tunnel. At one point I noted She Who Hates Me, but thankfully she didn't notice me, being too busy with some unidentified people she seemed to be tour guiding. After lunch they were still filming an animal behaviour. I kept 2nd AD Hans Berggren abreast of my location (usually craft services as this day they were playing on a PlayStation; previous and subsequent days also included watching DVDs), though I also let him know via equally pleasant PA Jason Kumalo. They set up my business. With some animal activity taking place in the foreground, in the background beyond the archway-tunnel, with six chickens wandering about, I walk by with a pair of small pails filled with alfalfa. I accuratey deduced it would be unlikely I would even be in focus. We did two takes. It is possible I walk by twice on the first take as Jason (who cued me to start) motioned for me to return. I thought he meant Back to One, but they were still shooting. So I had a one in three chance of one of the three walk-bys to be in the film, though as I predicted, that shot is not in the finished film. I changed for the second scene, and 2nd Unit 1st AD Rusty set up the business: using a small pitchfork to Finish Filling A Wide Pail with alfalfa, then carry it off. 2nd Unit Director Dean Cundey (also a very experienced cinematographer), had the shot all set up, then they beamed the framing up to the mansion for the film's [main] director Tim Hill... who told them not to have the stablehand (for that shot). Later the third scene was set up and Jason correctly figured I wasn't going to be placed. So Hans (who confirmed what I'd heard that this was the whole 2nd Unit's Last Day at this location), declared me Picture Wrapped, and thanked me profusely. I said my goodbyes to him, Rusty, Jason, Ariel, Iris, to always-helpful PA Mark Bruning (who signed me in and out each day), and others of the friendly crew, though many of whose names I didn't actually have a chance to learn. I'd recommend the Family Fare feature, but I wouldn't want to be accused again of Promoting The Film. Click on any thumbnail photo below for full size. From Val Sykes company website, the dreaded, "messenger"-hated photo of the Val Sykes reference model. 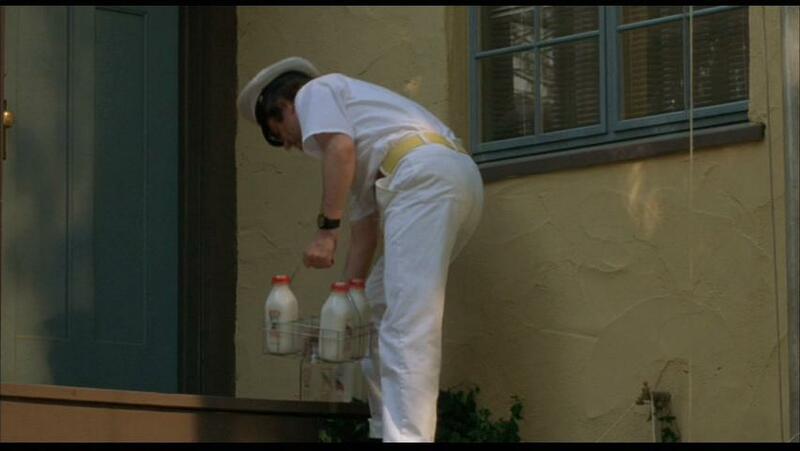 the Milkman in the first Garfield movie.